Best AR-15 Reflex Sights of 2019 – Read Before You Buy! Reflex sights are among the most popular types of sights for the AR-15, but with so many on the market, many consumers simply purchase what they can afford without really understanding how they work or what to look for. Read on for an in-depth look at the reflex sight and the best products on the market today. A reflex sight is not only an improvement over iron sights, but it works completely differently. Reflexes utilize a reflective glass element to illuminate your view while superimposing a reticle. This enables much greater precision and faster targeting. However, many variations exist not only for the optics but also for the reticle. Because they typically use electronic components, they also introduce other factors like battery life into the equation of your build. ​You ideally want a reticle that not only makes sense to you in design, but also is crisp. Units often have different sizes of reticles, which are measured in MOA. The smaller the MOA, the smaller and more precise the reticle. Although larger reticles are easier to spot quickly, they can obstruct your target if they’re too large. ​For any AR-15 component that uses a battery, you want a long-lasting battery. Not only that, you want one that’s easy to replace on the fly with a compartment that preferably doesn’t require tools to open, but is still secure and won’t open on its own. ​The best reflex sights allow you to adjust your brightness, which is great for varying light conditions. The greater the number of brightness levels, the more refined you can get your brightness. Additionally, some units have an auto-brightness function that automatically sets the best brightness for you. Now that you’ve checked up on your reflex sight knowledge, it’s time to gather up the best on the market. Keep in mind that while we’ve categorized our picks according to what they’re best at, you will still want to review the pros and cons to make sure you’re happy with the products and that they suit your needs. Contrary to what too many gun owners believe, the Sig Sauer Romeo5 demonstrates that you do not need to spend an excessive amount of money to get excellent features. With an incredibly crisp and precise two MOA red dot, you’ll enjoy virtually unparalleled accuracy to enhance your shooting. Additionally, elevation and windage are both easily adjustable with simple dial twists, which produce audible clicks. All this is visible through a fairly standard, but generous, 20mm objective diameter. As for illumination, you’ll get eight settings for daytime and two night vision compatible settings, allowing for precise shooting in any conditions. This extends to the fact that the unit is entirely waterproof up to one meter and is completely fog-proof. Not only is the unit durable, but so is the battery, lasting up to an incredible 450 hours on the highest setting. Many units last a fraction of this, so this is quite remarkable. Additionally, the unit is capable of automatically powering off or on when it detects movement, thus enabling you to push practical battery life beyond 50,000 hours by the manufacturer’s estimate. It comes with an integrated M1913 Picatinny interface for mounting on your AR-15 as well as any other compatible gun. Included is a low-mount riser, as well as a co-witness 1.41” riser mount, so you can use your preferred iron sights. Truly, this sight is a great value. Our only criticism would be that there is no automatic brightness setting but given all the other features available and the asking price, we think this is an exceptional value. 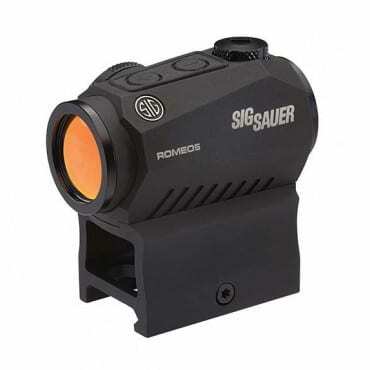 An excellent, durable unit with exceptional battery life and a crisp picture, Sig Sauer offers a great value with a red dot sight that should be a baseline standard in quality. Offering a great set of quality of life enhancements for a modest increase in price over our top pick, the Burris Fastfire III is an improvement over their acclaimed Fastfire II. You get three brightness settings, which may not seem like much. However, there is an auto-brightness setting which is actually more granular than the included three, and works well enough that you will likely never manually set your brightness anyway. Choose from a precise three MOA dot or a larger eight MOA dot, which is ideal for those shooting at closer ranges. Windage and elevation are fully adjustable with the use of a coin or similar-sized and shaped instrument. Compared to dials, this is obviously more effort but is preferred by some shooters who like their windage and elevation more secure. You may also choose whether you prefer a quick-attach Picatinny mount or weaver rail mount. You also get a handy low battery indicator, and the power shuts off after eight hours of use to prevent unnecessary drain. When the battery does run dry, it is easily accessible from the top without the use of tools or the need to remove your sight from the gun. Overall, it’s an excellent option for those who prefer to not adjust brightness on their own and want the quality of life features like a low battery indicator. 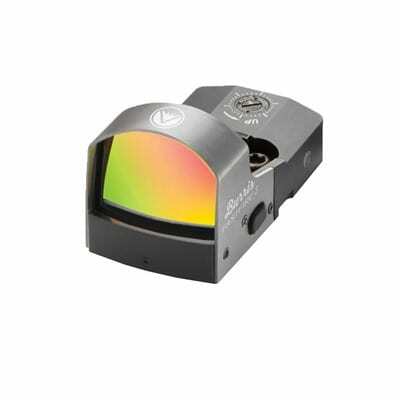 For a reasonable asking price, Burris offers a reflex sight not only designed to do the job well, but with accommodating features like automatic brightness. Our choice for the best reflex sight for an AR pistol, as well as a great value for budget shoppers, is the GERO Tactical Green and Red Dot Sight. Despite its low price tag, it offers an exceptional suite of features and great performance. As the name suggests, you may choose from either a red dot reticle or a green dot reticle, available in four different patterns. For those who are not aware, both colors function well in low-light conditions, but green tends to be better picked up during the day when the environment is more soaked in warm tones. Despite its low price, the unit has been constructed to survive tough conditions. 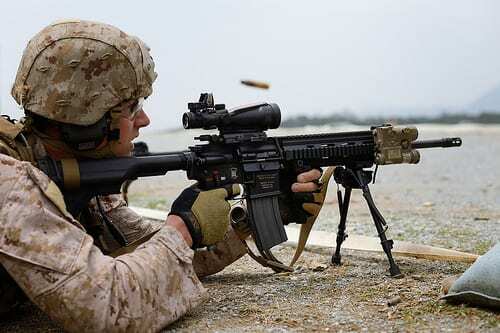 It is built to withstand direct hits to the glass by .68 caliber velocities without a scratch. Further, it is treated to resist water and shock, allowing you to reliably take it into a range of environments. A built-in Picatinny mount base ensures easy and fast installation or detachment. 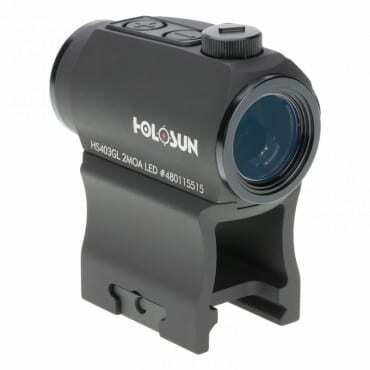 This, together with the price, make it an excellent option for those considering a reflex sight but still on the fence. It’s certainly affordable enough, and with easy installation and great features, it provides an excellent opportunity. This is further enhanced by the unconditional one-year warranty included. For budget parts, this is exceedingly rare. Sure, it’s not a lifetime warranty, but for the price, we find it to be highly generous, and it should allay any concerns about the quality of this unit. It’s hard to beat the price of this reflex scope without sacrificing on quality or features. GERO Tactical provides not only a durable and full-featured scope at a great price, but also a generous one-year warranty. If you’re absolutely on a restricted budget or have a need to stock up on spare sights, never fear. There’s always a cheap option that’s actually worth the money and won’t break the moment you open the package. They’re not easy to find, however, but we’re happy to say that CVLIFE has produced such a unit. Surprisingly, the unit is very rugged, made from high-grade aluminum alloy rather than cheap plastic. You also have a 22mm by 33mm screen, and your choice of three reticle types, including a circle dot, crosshair, a ten MOA dot or a three MOA dot, and you can even further choose from a red or a green dot. Five brightness intensity levels are available. This is actually a very surprising range of features on a budget unit. A ten MOA dot does border on being too big to be practical, although the three MOA dot is perfect and crisp. With all these features and such a rugged construction, you’d expect some substantial tradeoffs, but we continued to find great features. The lenses are fully coated to resist glare. An integrated Picatinny mount makes for an easy installation. Fully adjustable windage and elevation turns with easy-to-reach knobs. If you really want to be picky, the unit does not boast any waterproofing, but considering how affordable this unit is, we’re not surprised. That said, since the unit is durable, it may well be resistant to harsh environments and abuse, but the manufacturer doesn’t specifically mention any proofing, so we recommend you not test it out. We’ve really got to hand it to CVLIFE: this is a great budget unit. While you don’t get waterproofing or big extras like auto-brightness, the unit is durable and offers substantial features at a real steal of a price. Should I Buy an Open or a Tube Style Reflex Sight? A common concern is whether an open or tube reflex sight makes a difference. Is one better? As is often the case, it’s largely a matter of preference so long as you’re dealing with quality components. Your main concern with an open reflex sight should be durability. While a tube contains optics within the tube, the open reflex does not have that advantage. Of course, we’ve picked out open reflex sights that provide exceptional durability so that you don’t have to worry about this. On the other hand, tubes can take some getting used to, especially if you’re transitioning from iron sights. Learning to focus in on a picture that’s contained within a closed-off tube won’t be natural right away. It will take several sessions for you to really develop a feel for it, although, in the end, you will acquire your targets nearly as quickly. Again, tubes have the advantage of being more durable even if they’re cheap components simply by virtue of their construction. But we’ve only picked the best, so whether you’re opting for an open sight or a tube, you only need to worry about your preferences. No one wants a difficult installation. Thankfully, most reflex sights simply use a Picatinny rail. All of our options either include a mount or have an integrated mount, making for fast and easy attachment or detachment, even on the field. That said, there are extra precautions you can take to make sure your mounting is professional. We recommend using a thread locker like Blue Loctite to secure the screws of your mount. This ensures that the vibrations of shots won’t loosen your sight. Further, play a bit with positions before you commit to one. With an unmagnified scope, you do not have eye relief, so be sure that you position it where you find that you have the best field of view. Alternatively, you may want to position it so that you can mount a magnifier in conjunction, behind the optic. You can even, contrary to popular convention, mount your sight forward enough to back up your iron sights so you’re safe should your electronics fail. A reflex sight is an excellent and popular way to improve precision and accuracy, but the market is flooded with both cheap and expensive parts that aren’t worth your money. Use our guide to determine the best fit for you and rely on our top picks to improve your shooting. Due to the popularity of reflex sights, there are many questions gun owners often have that, unfortunately, go unanswered. Let’s clear up the confusion before you commit to your purchase. How Does a Reflex Sight Work? A reflex sight is fairly straightforward. The unit encases a reflective glass element that illuminates your view, while an electronically-powered reticle superimposes the image. Often, the electronics also allow for the electronically-powered reticle to be brightened to accommodate various lighting conditions, while knobs or other components allow you to adjust windage and elevation. What's the Difference Between a Reflex Sight and a Holographic? Actually, they are quite similar. In fact, a holographic sight is simply a variation of a reflex sight. 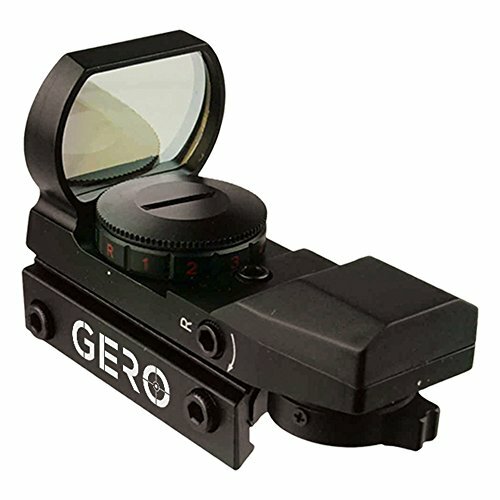 While most reflex sights use an LED to reflect the reticle onto curved glass, holographic sights use a laser and a screen. Because of this difference, holographic sights tend to have a lower battery life. Reflex Sight vs. Iron Sights: What’s the Difference? The most obvious difference between reflex sights and iron sights is that iron sights are not particularly adjustable. They are solid pieces of equipment that rest on top of your gun. Typically, they are considered very fast but not very precise. 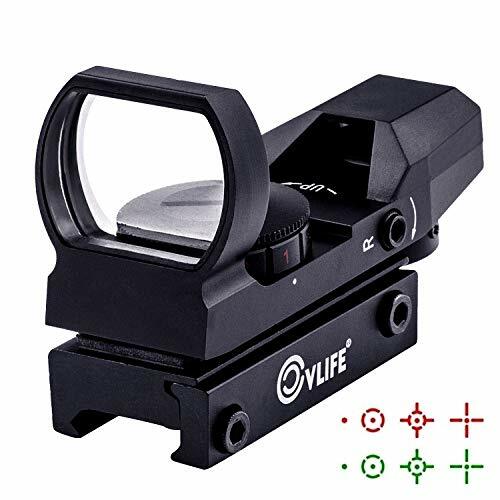 Reflex sights help to frame your view and provide a reticle which is superimposed with electronics or a laser and thus, enable you to see in light conditions where iron sights usually do not perform well. What is a Reflex Sight Used For? Reflex sights serve many purposes. They are excellent for shooting in low-light conditions thanks to adjustable brightness. They also feature very precise reticles that help achieve more accurate shooting. Because of this, they can be used for anything from hunting to self-defense or even sport and military applications. They are ideal any time that iron sights are insufficient due to poor lighting or the need for greater precision.